Robin D. Owens has received numerous awards for her novels of paranormal romance including the RITA, PRISM, and P.E.A.R.L. She lives in Denver, Colorado. Read excerpts at Robin D. Owens’ website. Mystic Circle — (2011-2012) As one of the last surviving Mistweavers, half-blood Jenni knows what it’s like to be caught between two worlds: the faery and the human. But the time has come to choose. The Lightfolk require her unique talent for balancing the elements to fend off a dangerous enemy — and rescue her missing brother. Only for Rothly will Jenni deal with those who destroyed her life. Only for him will she agree to work with her ex-lover, Tage, and revisit the darkest corners of her soul. For a reckoning is at hand, and she alone has the power to hold back the forces of dark…. 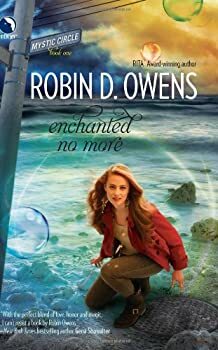 I was drawn to Enchanted No More by the vibrant hues of the cover art and because the plot summary — centering on a half-faerie woman sucked back grudgingly into court affairs — reminded me of one of my favorite urban fantasy series, Seanan McGuire’s October Daye. Celta — (2001- ) These are separate stories that take place in the same world. Ms. Owens suggests reading them in this order. Publisher: With their magic boundaries falling and terrible monsters invading, the Marshalls of Lladrana must follow ancient tradition and Summon a savior from the Exotique land… For Alexa Fitzwalter, the Marshall’s call pulled the savvy lawyer into a realm where she barely understood the language, let alone the intricacies of politics and power. Armed only with her wits, a mystical companion and the help of the chevalier Bastien, Alexa must use her very human mind and skills to fight the encroaching evil — and resist manipulation by the Marshall’s to force her to stay in Lladrana. Now torn between her affinity for this realm and Earth, will she return home if given the chance? Or dare she risk everything for a land not her own? CLICK HERE FOR MORE CELTA STORIES BY ROBIN D. OWENS. The Summoning — (2005-2009) These are separate stories that take place in the same world. Ms. Owens suggests reading them in this order. Publisher: With their magic boundaries falling and terrible monsters invading, the Marshalls of Lladrana must follow ancient tradition and Summon a savior from the Exotique land… For Alexa Fitzwalter, the Marshall’s call pulled the savvy lawyer into a realm where she barely understood the language, let alone the intricacies of politics and power. Armed only with her wits, a mystical companion and the help of the chevalier Bastien, Alexa must use her very human mind and skills to fight the encroaching evil — and resist manipulation by the Marshall’s to force her to stay in Lladrana. Now torn between her affinity for this realm and Earth, will she return home if given the chance? Or dare she risk everything for a land not her own? The first story, Song of Marwey, can only be read online here. CLICK HERE FOR MORE NOVELS BY ROBIN D. OWENS.